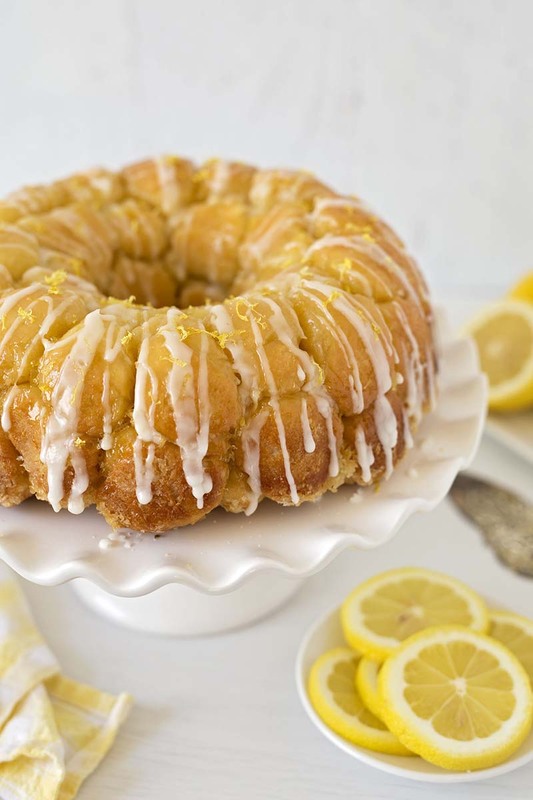 This sweet bread is a lemon lover’s dream. Every little bite of this luscious lemon bread is coated in a sweet tart lemon sugar. It’s baked until crispy & caramelized on the outside, and sticky & gooey on the inside, then drizzled with a tart lemon glaze. In microwave safe bowl, heat milk, sugar, salt and butter to 120° to 130°F. Stir to dissolve sugar. Mix 2 cups flour and yeast in stand mixer fitted with a beater blade. Turn machine to low and add the heated liquid mixture. Beat on medium speed for 3 minutes. Switch to the dough hook, gradually add the remaining flour (add more or less as necessary) until dough clings to the hook and almost cleans the sides. Knead until the dough is smooth. Turn dough onto lightly floured counter and knead briefly to form a round ball. Coat a large bowl with nonstick cooking spray. Place dough in bowl and coat surface of dough with cooking spray. Cover bowl with plastic wrap and rise in a warm place until dough doubles in size, about 2 hours. Spray a 12-cup Bundt pan generously with non stick cooking spray. Make lemon sugar coating: Mix sugar and lemon zest together in a small bowl. Place melted butter in second bowl. Set aside for the sugar coating. Working one at a time, dip balls in melted butter, allowing excess butter to drip back into bowl. Roll in lemon sugar mixture, then layer balls in Bundt pan, staggering the dough balls to build layers. Preheat oven to 350°F. Unwrap pan and bake until top is deep brown and begins to bubble around edges, 30 to 35 minutes. Cool in pan for 5 minutes, then turn out on platter and allow to cool slightly, about 10 minutes. I would LOVE to see complete nutrition information with each recipe. LOVE RED STAR YEAST. I have used it for 60 years! Wow, we are so honored to be your go-to yeast of choice! Thank you for your loyalty! We hope to add nutritional information to our recipes soon. Really a great Sunday morning breakfast treat.